In the past the owner has gone out wild boar hunting and has brought back some to share with all of us. He makes the most amazing wild boar ragu I have ever had. It literally has twice as much meat as pasta. It is stewed for hours and has great flavor. I watch for this and ask for it every time I am in. I should just save myself some time and find out when wild boar season is and just check in after that right? 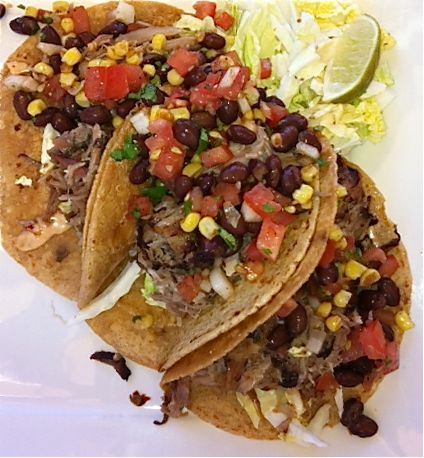 We have also gotten their fish tacos. This is a great light meal. They change up the fish depending on season and availability. Last time we went it was ahi tuna and it was also being served with the creamy chipotle sauce. Always on the menu is the stroganoff. There are some days I just crave good comfort food, which means heavy creamy food, and this my friend is the tickets. It has huge chunks of meat on a pasta with a super creamy white sauce. I have ordered that more than once. 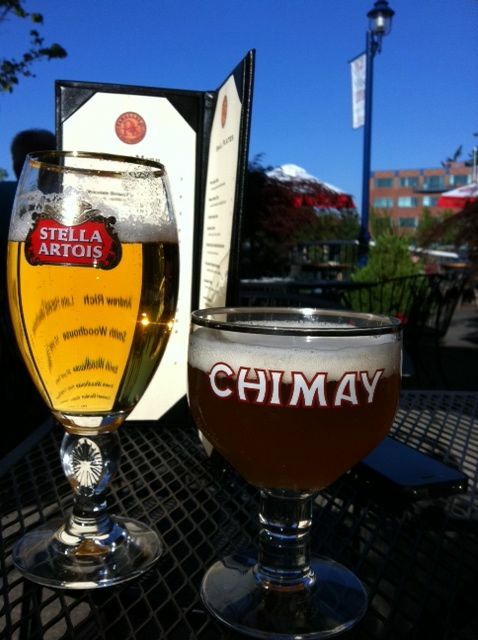 Stella,Chimay and a sunny day. What's not to love? Parallel 45 is a wine bar, so their selection of wine is plentiful. The beer on the other hand is not so plentiful, but that’s ok. They have a few things there that I like and I am happy. I usually choose a chimay with my meal or if I don’t want something quite so hoppy I go with a Stella. October 2011 UPDATE :: We went again tonight. Fall is in the air, so it calls for comfort food. I order the Stroganoff with steak. I love this dish. It’s filling, hearty and most definitely comforting. There is a really nicely flavored cream sauce that is not over bearing. I licked my plate clean. Atmosphere is pretty awesome here. In the summer you can sit out by the lake and in the winter you can grab a booth or bar stool. But either way, make a reservation or show up early, this place is small and fills up quickly. Huge wine selection, decent beer selection. Pretty sure there are no mixed drinks. Pricing is pretty average for they type of restaurant, but the food and quality are worth it. My 3 tacos set me back about $12. Yes, this is the place that has no ice. So you for sure answered whether or not they have mixed drinks. They do not.